Thirty three times the Space Shuttle Atlantis journeyed into space before finally coming to rest and now on permanent display at the Kennedy Space Center’s Visitor Complex. I have been down to KSC many times over the years and I have seen Atlantis launch, land, and I walked under it as it sat in the Vehicle Assembly Building waiting to be configured for display. I have seen the Shuttle on the back of the Shuttle Carrier Aircraft and on static display at the National Air and Space Museum’s Udvar-Hazy Center, but the Atlantis display at KSC is a cut above the typical display. It is a stunning, world class exhibit. Over the years, the Kennedy Space Center Visitor Complex had begun to resemble the very program it was representing. Since its official creation in 1965, it struggled to provide an experience that visitors and space enthusiasts would appreciate. In 1995, the operation of the complex was turned over to a private firm, Delaware North Companies (DNC). DNC was charged with managing and supporting the center and doing it without taxpayer funding. Looking back, it appears that decision has paid off and the complex set forward on a path to compete as a tourist destination in entertainment competitive Florida. New items were added like the Saturn V Center in 1996 and the Shuttle Launch Experience in 2007, but years of wear and tear, dated infrastructure, and a lack of new exhibits gave the center a stale feeling. First time visitors might not have noticed and taken on the “Behind the Scenes” tours or viewed the magnificent Saturn V and marveled at America’s space past. They may have been lucky enough to watch a launch, but repeat visitors knew that the core complex was showing its age. While NASA still struggles to get the proper funding and get the manned program back on track the KSC Visitor Complex has been reborn and reinvigorated. The complex has undergone a makeover with a new entrance and updated facilities. Some of the old still remain, but the overall experience has improved dramatically. The star of show is the new display of the Space Shuttle Atlantis. It would have been easy for Delaware North to build a hangar type structure and roll the Atlantis in to be viewed by fans and visitors. Enhancing the experience by doing something different, more expensive, or unconventional would not have affected the number of visitors drawn to the center to see the shuttle on display, but they went the extra mile anyway. The Delaware North Companies made an investment of $100 million dollars in the new Atlantis exhibit. About one-fourth the estimated cost of a single Shuttle launch. What they received for their investment and what each visitor will see is a one of a kind display that anyone, space enthusiast or casual tourist will find amazing. 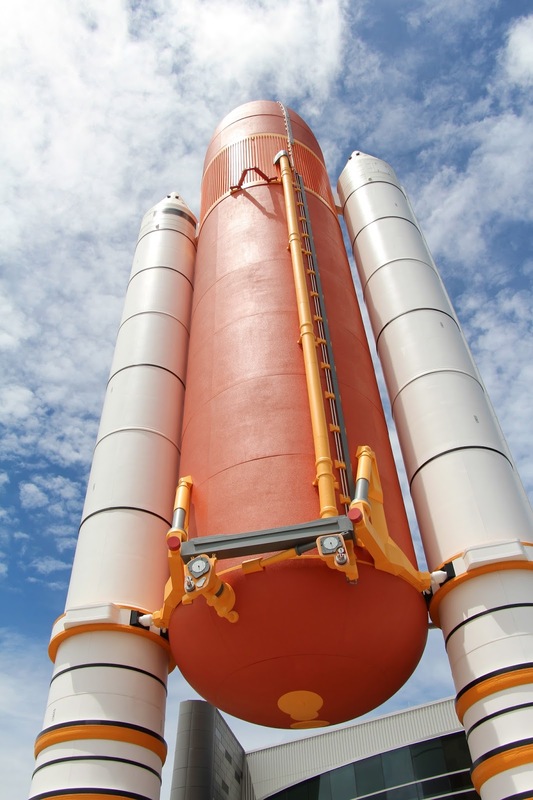 The first thing a visitor will notice driving to the complex is the towering Space Shuttle External Tank and Solid Rocket Boosters. The tank and booster stand like the ancient world’s Colossus of Rhodes, an imposing sight that pays homage to the modern day technological wonder that it guards. Once inside, visitors make their way to the up to the upper level of the building. To manage the flow of visitors, prior to accessing the exhibit, guests are treated to a short film history on the development of the shuttle. The film that is shown is interesting docudrama that leaves you wanting more of the story. After a brief second film of the Space Shuttle in action, guests access the exhibit. The exhibit hall and display are nothing short of amazing. The Shuttle is elevated to the upper level and angled towards the walkway for visitors. It is shown with its gear up, payload bay doors open, and arm extended in a configuration that is meant to depict how Atlantis appeared is space. As you walk around the exhibit, you quickly come to see that the Shuttle is an imposing sight. Guests are feet from the Shuttle and get a different feel for how big this spacecraft is from end to end. The viewing area is spacious with interactive displays and plenty of room to get excellent photos of the vehicle. As you wind down to the ground floor there are additional views of the Shuttle and more interactive events for kids of all ages. At the bottom of the display, you are standing beneath the Shuttle that is at its highest point 40-50 feet above your head. I have seen the Shuttle many times before, but I was still struck by the size of its delta wing underbelly. In this unique display, you get to see it in a way that is not normally viewed and that makes all the difference. Seeing the overall size, the number of tiles and the Shuttle landing gear doors gives a new appreciation for the complexity of the machine you are looking and what it took to get it to, and bring it back, from space. Those that have not been to the KSC Visitor Complex in a while will be quite surprised at its new look, but thrilled at the sight of the Space Shuttle Atlantis. Any Space Shuttle on display is a sight to see, but unlike the display of the Space Shuttle Discovery at the National Air and Space Museum in Chantilly, Virginia or the Space Shuttle Enterprise in New York City, Atlantis is not just a must see sight, but an experience, and goes to the top of the list for any fan of the space program or anyone that want to marvel at the technology of the American space program.